Joshua has a passion for making interdisciplinary connections between biology and design while pushing the limits of creativity in all that he does. Coming from a DIY and Maker background, Joshua loves to explore ideas, processes, fabrication methods, and technologies related to design. He believes that everyone is creative in their own way and that one's passion for creativity can help overcome any challenge (for even failure is an opportunity to grow). Being a problem solver, pioneer, and innovator is important to Joshua, and he is constantly seeking out new needs to design for and products to develop. Joshua focuses on prototyping and model making, executing at various levels of fidelity in a detail-oriented fashion. He seeks to create objects that have never been created before, utilizing the cutting edge techniques in prototyping to achieve this goal. As an undergraduate at Northwestern, Joshua received the Segal Design Certificate while completing his major in Biological Sciences. During the courses he took through the Segal Design Institute, Joshua turned his passion for design and fabrication into skills to develop real, impactful products. A key project that Joshua worked on that sparked his passion for human-centered design was a body weight support treadmill training system that he created for stroke survivors with two other teammates for the Rehabilitation Institute of Chicago. This system was a safer and more cost-effective therapy device for stroke survivors to utilize as they relearned how to walk. That experience showed Joshua the importance of critical design thinking using a human-centered approach, as well as the importance of detailed consumer observations and product iterations. Since then, Joshua has been developing his prototyping skills for both conceptualization and physical product production. 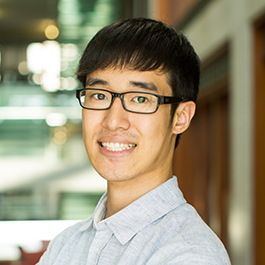 Leading teams in prototyping endeavors, Joshua hopes to be able to apply his 6 years of prototyping experience in new ways. Joshua is the founder and prop maker for Kimer Props, a replica prop and cosplay business founded in 2012 that stemmed from his passion to create and innovate. Kimer Props has allowed Joshua to experiment and hone his skills in many fabrication methods including silicone molding, resin casting, product finishing/painting, and 3D printing.